Toyota Hilux further solidify its reputation as the Indestructible truck, complete with a trip to Antarctica (South Pole), with a total distance of more than 9495 km. This expedition once again shows Toyota Hilux vehicles are the most powerful and most reliable to deal with any terrain on earth. To deal with the extreme climate in the South Pole, three Hilux, including the 6x6 model, using the fuel Jet A-1. Third Hilux was operated for four months, from November 2011 until February 2012. Using a standard diesel engine 3.0 liter D-4D, is also a standard transmission. To be able to adapt to extremely cold temperatures, can reach -50 degrees Celsius, as well as rugged terrain and steep, up to as high as 3400m (equivalent to the highest mountains in Java), Hilux in specially prepared by Artic Truck. Company based in Iceland is indeed a specialist to prepare the cars that will be used to explore the poles. Modifications were made, including strengthening the suspension system and propulsion system. Also the addition of crawler gear on the transmission system, so the pickup is still able to move in any condition as extreme. And the use of extra large tires that were given air pressure 2-3 psi (compared to regular tires Hilux used daily by 29 psi). The result is a footprint 17 times larger than standard tires. Another modification is the installation of cranes for lifting heavy loads and fuel tank capacity of 280 liters (on the 6x6 version, the tank 800 liters). Distance of almost 10,000 miles is a record for longest ever undertaken similar vehicle. Moreover, the Hilux could complete the expedition without experiencing mechanical problems though. 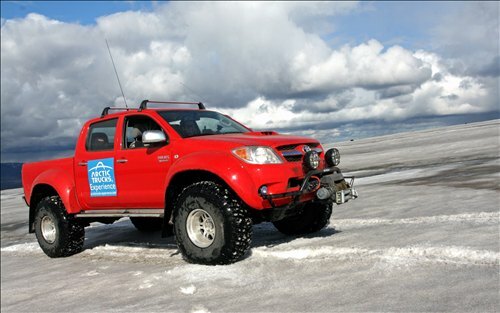 Toyota Hilux pickup is the only one who can reach the North Pole and South. Top Gear - one of the famous TV auto show - ever tried to destroy the Hilux. It took a few episodes and a variety of ways to kill a Hilux. On one episode, the former Hilux drowned in choppy ocean racing. Hilux in the chain should be tight so as not to be dragged. After several hours, the Hilux is pulled out, and still can turn and run. Hilux never hit the ball crusher building, caravan overwritten, even placed on the roof of the building and building until it collapsed in the explosion. Hilux removed from the debris that buried him, appeared to still be alive and still able to drive.